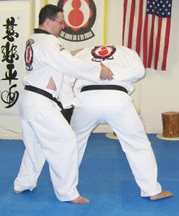 Response: Response: Step to the side at a 45° angle, chop down on the wrist of the punching arm. Grab and rotate the wrist, using your thumb to go slightly underneath the wrist for leverage to twist the hand and arm. 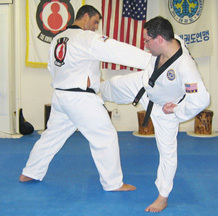 Twist the hand and arm, which well bend your opponent over slightly and deliver a roundhouse kick to the stomach (kyop!) 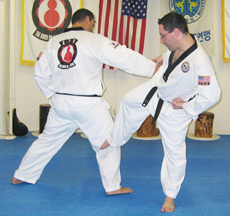 Follow this roundhouse kick with a downward low side kick to the inside of the knee. 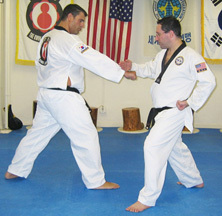 Step down with your right foot, bring your left foot over so you are practically behind your opponent, fully twist the arm up and behind the back.